This morning would be my last morning and since I was on the 2 pm train back to KL, breakfast was to be fast and simple so once again we got into the car and turned through a lot of back lanes, and voila.. a clean little corner shop it was Restoran Low She Fun. I’m sorry but in all my haste I forgot to look around at the address, and I cannot seem to find it online, so therefore, I think this is a little hidden gem that no one has fossicked yet. Low She Fun is known as little rat tails because it resembles the tail of a shrew. So there we were in this coffee shop that solely served this specialty and fish balls. 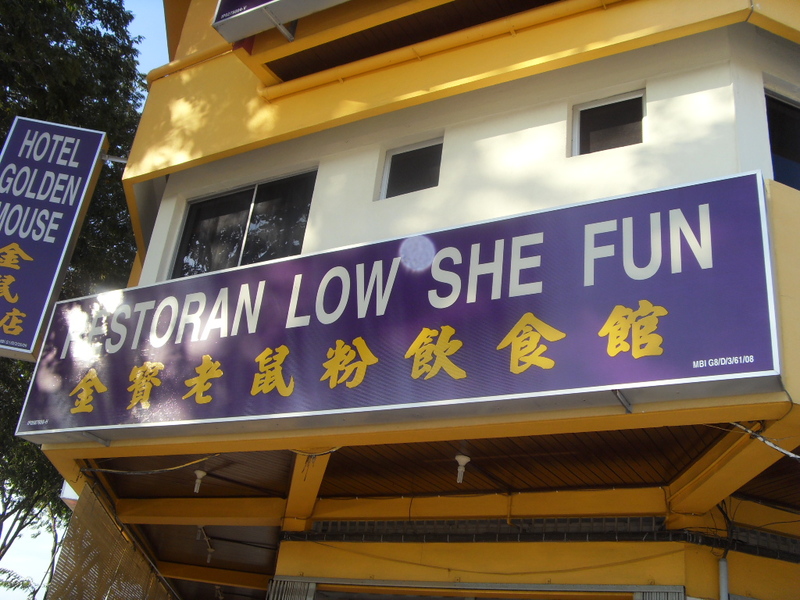 I am not a fan of Low She Fun simply because it always tends to be oily. The one we get at the market or the ones I have had here, mind you it would be probably be about 20 years or so since I ate Low She Fun in KL or PJ, and the sight of the oil just never made me want to try it again. Also I believe there was one time either in the late 80s or early 90s when some kids died eating Low She Fun, so that was another reason why. Anyhow we got there, it was a rather windy morning, and the nice breezy cold day was warmed by the wonderful brewing hot fish ball soup. I don’t know what it is but the fish balls and meat balls sold in Ipoh are by far the most superior I have eaten. Ordinarily I would not even bother to touch the stuff. 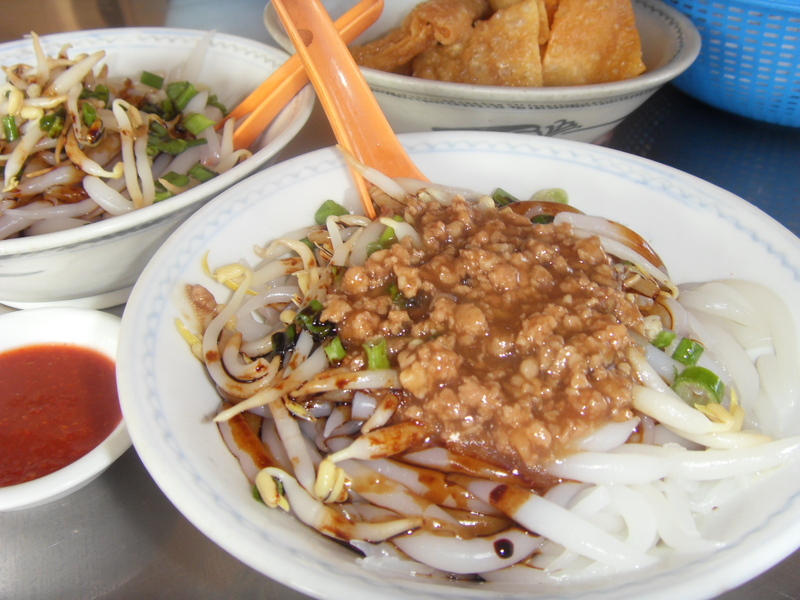 Ah Yoke Cher did her usual of ordering, and since we were going out to lunch we only ordered 2 bowls or Low She Fun, one plain with soy sauce and luscious Ipoh Bean Sprouts, and the other topped with Minced pork. We also had a few fried won tons. The first glance one would think it was such a simple breakfast but the first mouthful would deem otherwise. The simpliness in looks, but the taste of a lot of good ingredients being put together often leaves one wanting more. This was the case at breakfast today. I took a small amount to taste, and it was sheer delight. The Bean Sprouts were so lightly blanched and eaten with the noodles in the simple soy sauce was like eating a nice noodle salad. The minced pork one was a little richer because it was more meat then fat in the mince. The mince did not leave a fatty taste in your mouth nor did it have that horrible gluggy feeling when you have eaten a lot of fatty foods. It was just a soup spoon or so and yet it gave a lot of tastiness. The wontons were nice and had a nice amount of filling. One look at it you’d think it was a lot of skin, but the ratio of filling and skin was almost perfect. I was told by Seok Hean that this was an old business and the owners son’s even quit their jobs to take over the business. Now I have to say I am not a fan of hawker food. I live near various hawker stalls and you can count the amount of times I go to these places, and yet I think if I lived in Ipoh it would be really different. I am not running down hawkers in PJ and KL because I am sure there are a few gems out there, but in most cases, I think a little pride would be good. Often I have even tasted food raved upon by food critics in the newspapers only to be so fooled by them. Sadly when Ipoh food comes to KL, it never tastes the same. 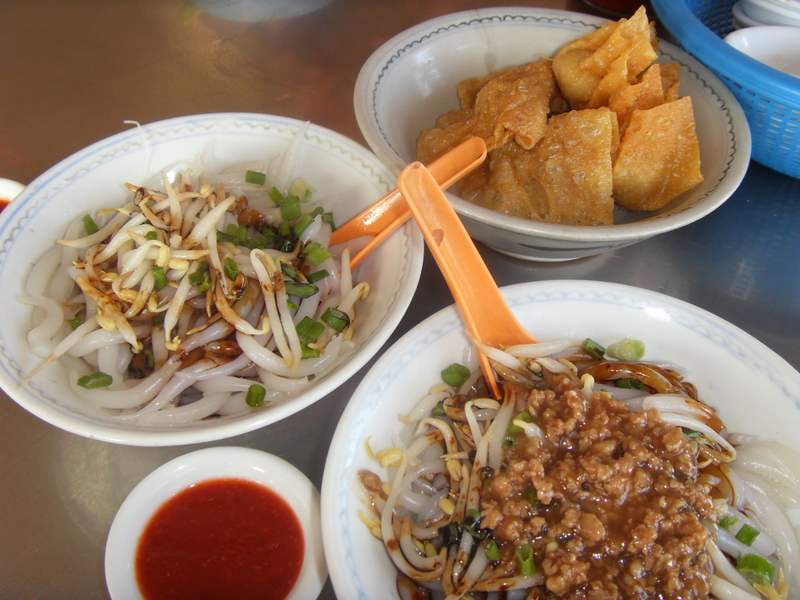 My last breakfast was truly memorable, just like my first breakfast of Ipoh Curried Noodles. 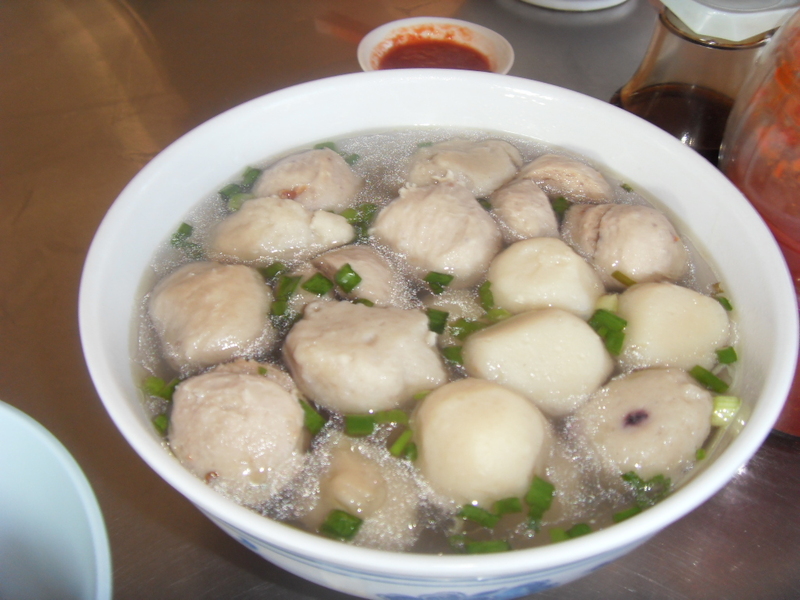 This entry was posted in Foodie Escapades and tagged Fish Ball soup, Ipoh, Restoran Low She Fun, simple yet so tasty, Teoh Seok Hean, Won Tons. Bookmark the permalink.